Village, state, and private properties. activities to perennial waters, wetlands, private properties, and public right-of-ways. the permittee, landowner or land user from other applicable federal, state or local regulations. upon any person or property attributed to a project of the permittee. dwelling, or after the building inspector has preformed the final inspection. of a soil conservation or water pollution control project. Ordinances or town authority in extra-territorial areas. trails where access is needed for public or private use. reducing runoff pollutants from leaving the site. (6) "Landowner" means any person having fee title ownership of the land. of the floodplain, whichever distance is greater. subchapter III of Chapter NR 151, Wisconsin Administrative Code. that the methods have been approved by the Commission. compared with no sediment or erosion controls, until the site is stabilized. 21.07 MAINTENANCE OF CONTROL MEASURES. 21.08 CONTROL OF EROSION AND POLLUTANTS DURING LAND DISTURBANCE ACTIVITIES. Categories A, B and C. The site area is the sum total of individual areas on the property. within 24 hours of the end of the storm event. shall be cleaned up by the end of the same workday. 630 and 631; Mulch, Fertilizer, Seed and Sod sections respectively. 21.10 PERMITS AND CONTROL PLANS. to enter the site to obtain information required for the review of the control plan at any time. proposed land disturbance activity to streams, rivers, lakes, private properties, and wetlands. Registered Professional Engineer unless waived by the approval of the permit. apply unless the disturbed area total exceeds one acre. 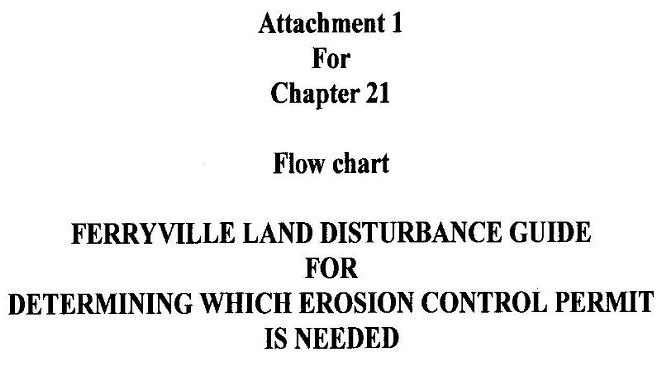 if the land disturbance activity is determined to have minimal off-site erosion potential. control plan is required for each situation. as disturbed areas of more than one acre or commercial building sites. writing of the reasons for disapproval. issuance by the Plan Commission and the payment of any applicable fees. necessary to meet the requirements of this Ordinance. proper installation of erosion control and storm water management measures. and approve the final installation. prior to or after the issuance of the permit. provisions pursuant to 92.07(14), Wis. Stats. as applied by this Ordinance. (b) The conditions of the permit are not being met. (d) Land disturbance activities are being carried out improperly. or Commission may revoke the permit. retract the stop-work order or the revocation depending on actual on-site conditions. 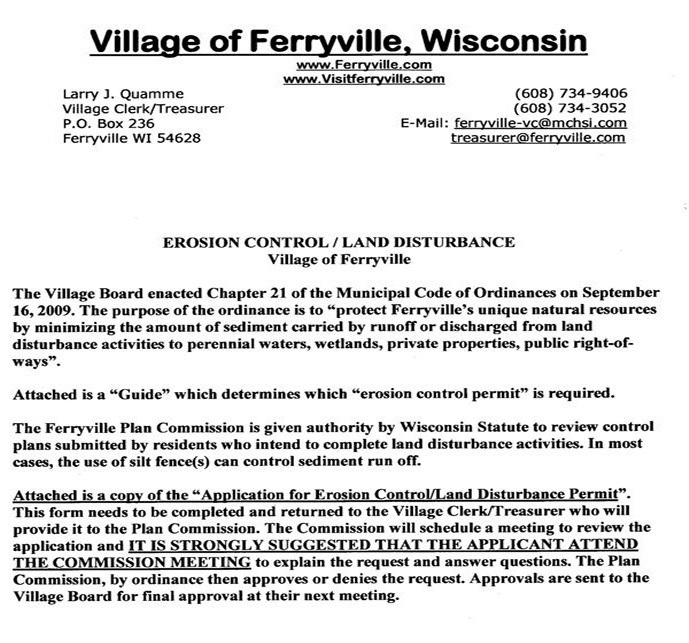 special assessment against the property pursuant to current procedures allowed by Wis. Stats. and stabilized according to the Commission's requirements. deciding appeals and authorizing variances. relative to sites in which that person has interest. 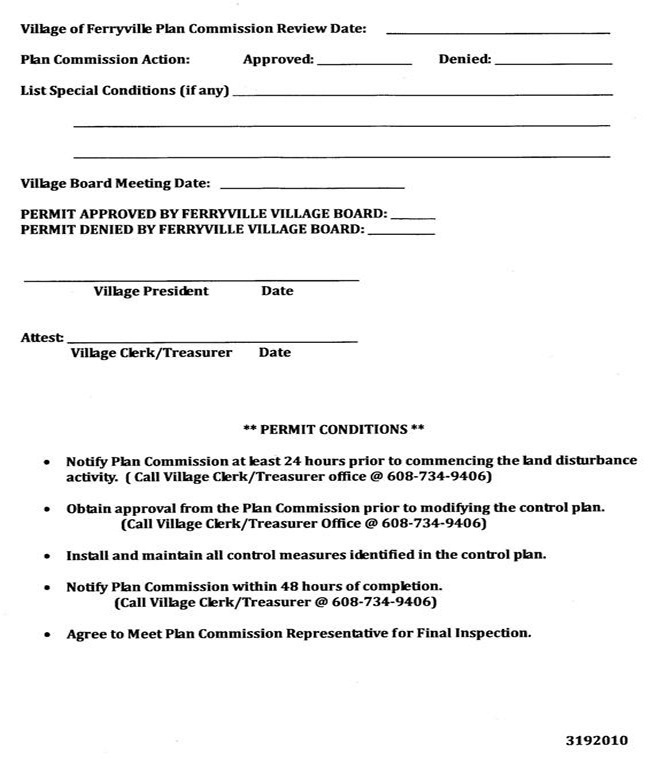 any previous Ordinances of Ferryville that are or may be in conflict therewith. 21.15 FEES. Control Plan Review and Re-submittal Fees. submitted may be charged except where re-submittal is required. ordinary fee for the project. not been granted, the permit fee shall be assessed at five times the ordinary fee. 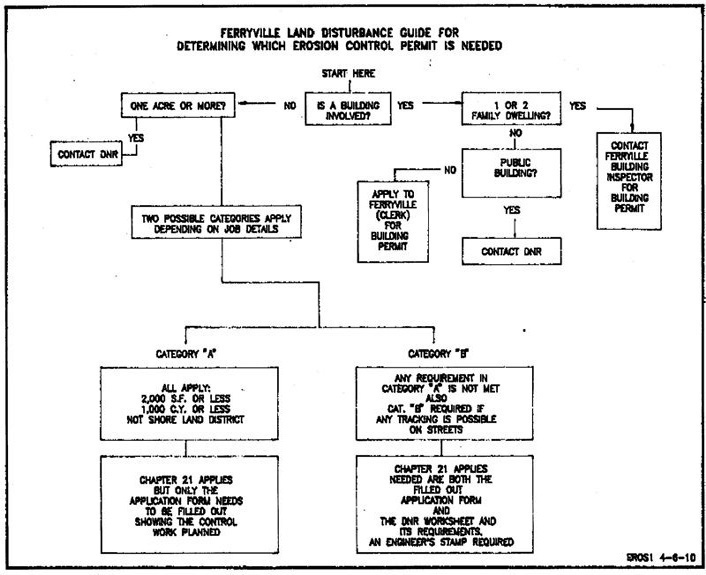 Attachment 1: Flow Chart entitled: “Ferryville Land Disturbance Guide for determining which Erosion Control Permit is needed”. 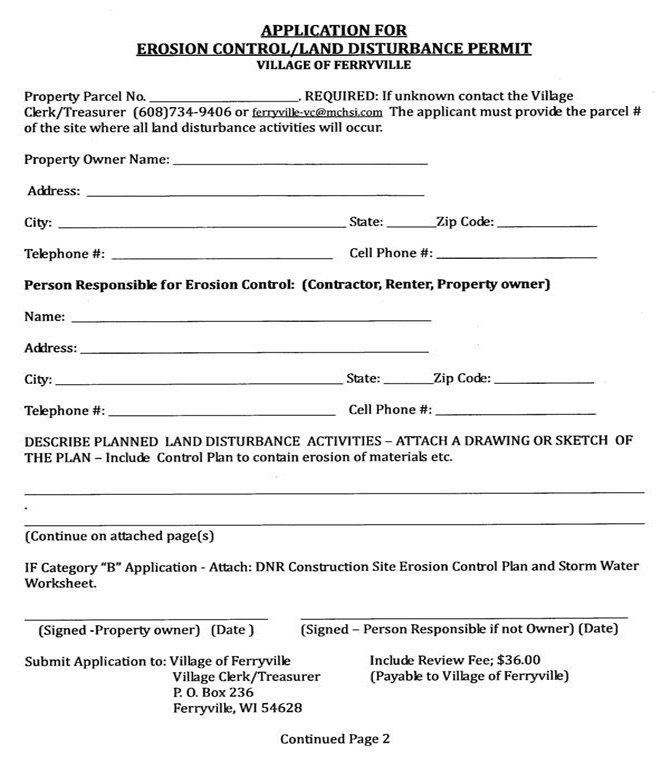 Attachment 2: Sample Copy “Application for Erosion Control/Land Disturbance Permit”. 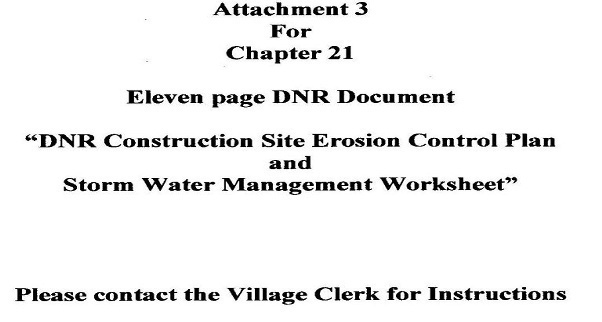 Attachment 3: Sample copy of an 11page DNR worksheet, “DNR Construction Site Erosion Control Plan and Storm Water Management Worksheet”.